Memorial Day’s just around the corner and 4th of July will not be far behind. These holidays offer a variety of festivals and family gatherings. You’ve done these things annually; why not let your creativity shine through and make this year an outrageous one? 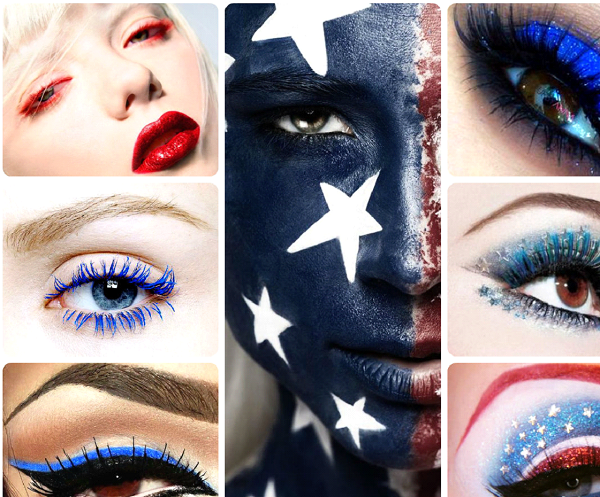 Show some love and strong patriotism by trying a new makeup look, or just by simply adding a wash of patriotic color on your eyelids and lips! Many of us are tired of those neutral makeups we see everyday. Let these events give you an opportunity to rock bold colors that resemble the American flag! To help you achieve this style, we’ve compiled several looks from beauty bloggers and makeup gurus that might suit your interest; plus tips on how to recreate the looks. Our main focus will be to glam up the eyes. You can even add your lips if you’re a true rebel and brave enough to flaunt a colorful face. The main colors will pull from the American. 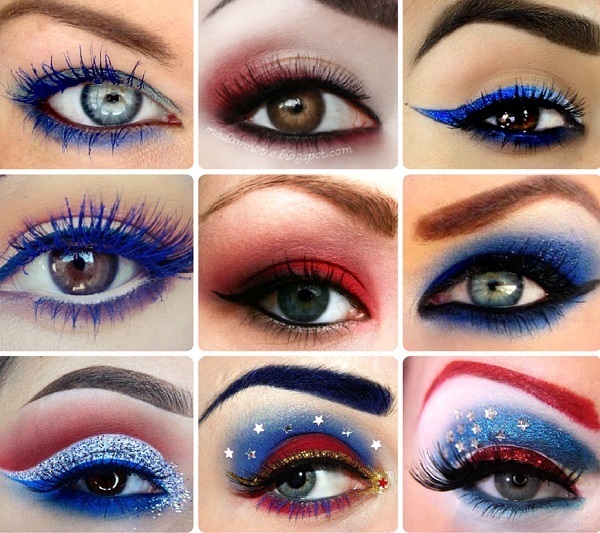 To get with the patriotic theme, you need an eye base/primer and eyeshadows in blue, red, and white. You can use stars for accents and choose between mascara or false eyelashes. Eyeliners are available in red, blue and white; and red lipstick is a must! Shy and not too confident to rock bright colors? You can tone it done and use eyeliners and mascara for eyes, but exchange the typical black liners and mascara for royal blues, metallic blue or even crimson colored eyeliners and mascaras. In my opinion, blue eyeliners can bring out the best in those who are born with blue eyes. Apply it near the lashline if you want it on your upper eyelid, or apply it on the waterline (for pencil eyeliners only) if you want it on your lower eyelids. I also suggest you try creating cat/winged eyes or go extra bold with double winged eyes! If you want more fun, try wearing both: blue eyeliner with blue mascara or red eyeliner with red mascara. If you’re an eyeshadow girl who doesn’t want too much attention or the color-blocking effect of two or three strong colors mixed into your eyelids; go for just a monochromatic blue or red eyeshadow using eyeshadow palettes with different shades of each. Finish the whole look by using black liquid eyeliner, black pencil eyeliner, and a bit of black mascara. 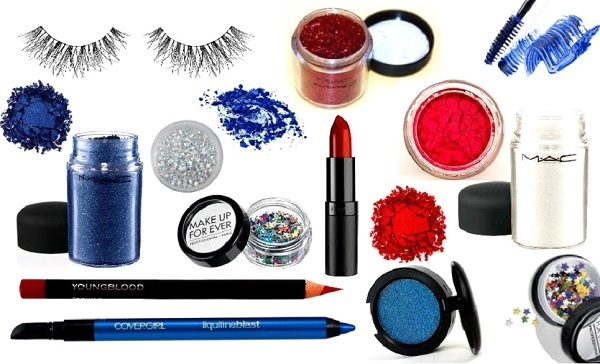 Play up with your eyes by blending in two or three eyeshadows in shades of blue, red and white, or you can use silver pigments or silver glitters to replace white if you think it’s too boring. Now is the time to use false eyelashes to add more drama. Be more creative by adding accents on your temples or in the outer “V” of your eyes by adding stars, rhinestones or crystals, thicker false eyelashes, and even incorporating a colored mascara or colored eyeliner, play up with the wings and crease of your eye makeup or even wear colored contact lenses for an even more futuristic look. I would also like to share with you the look that I’m planning to wear for Memorial Day. 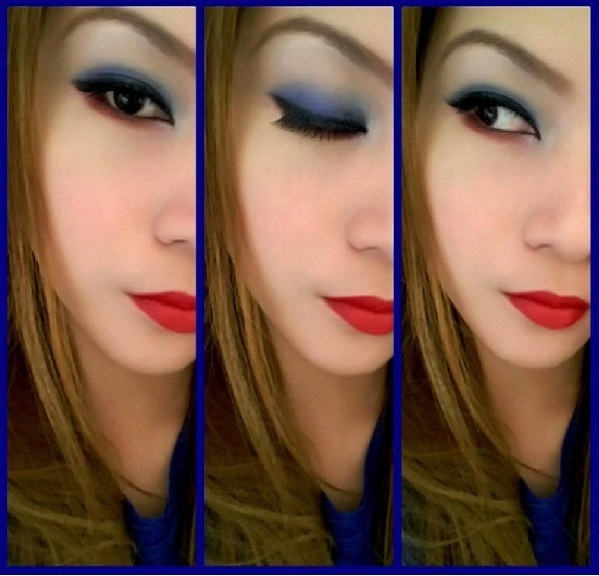 I go for a blue eyeshadow and red eyeliner mixed with red eyeshadow. For all the eyeshadow looks I’ve suggested, a bold red lipstick is always the perfect pair for it. Now I’m challenging you to create a patriotic look and send it to us! You can learn how to create the extreme flag look in the video below. Leave your feedback and favorite makeup looks in the comments below! Tips to make your holiday road trip the best vacation ever. Fringe is the perfect look for summer!